“Aw, hell, what?” Buck thought. He wondered if this was perhaps a bad dream, that he was still asleep. But his room looked normal, the Ricky Stanzi ‘USA Number 1’ poster hung on the wall, he even still had ‘Hawkeye’ on his belly, though in truth it was more like his thorax or abdomen now. Buck wasn’t up to speed on his insect physiology. “Gotta get up,” Buck said out loud, surprised that it came out as a series of clicks and squeaks. He wasn’t sure how to get up, though. His legs were not capable of grasping anything for leverage and his armored body wasn’t flexible enough to slither shift himself out piecemeal. Recognizing that he needed to get off his back, he began to move his legs side to side, in unison, until he rolled off the bed, with a thud. His legs scraped loudly against the wood floor as he scrambled to his feet. “Buck!” a voice yelled from outside the room. “Buck are you okay?” It was his momma, Wanda. She was just outside the door. He turned and said “Hold on momma! I’m fine. Don’t come in,” which manifested as a series of clicks followed by a long, angry hiss. Buck didn’t know what to say. He had grown up in Iowa and attended the University of Iowa for accounting. But Iowa, being 90% soy milk precursors and rusted-out El Caminos, didn’t have much in the way of jobs. He moved to Minneapolis and found work, but maintained his allegiance to the Hawkeyes. “But I’m in Iowa now, visiting you!” Buck yelled in a low, ominous rumble of staccato clicks. He knew he couldn’t open the door. Beaver was a Raid salesman and would zap him before he hit the front door. He buzzed his wings nervously as he thought through what to do. If he quit his job in Minneapolis, would he be turned back into his normal self? Or was this punishment for his parasitic existence permanent? “I’m going to get the Raid,” Beaver said. “No, Beaver, he’s our son, you can’t!” Wanda screamed, chasing after him. Buck stood silently. 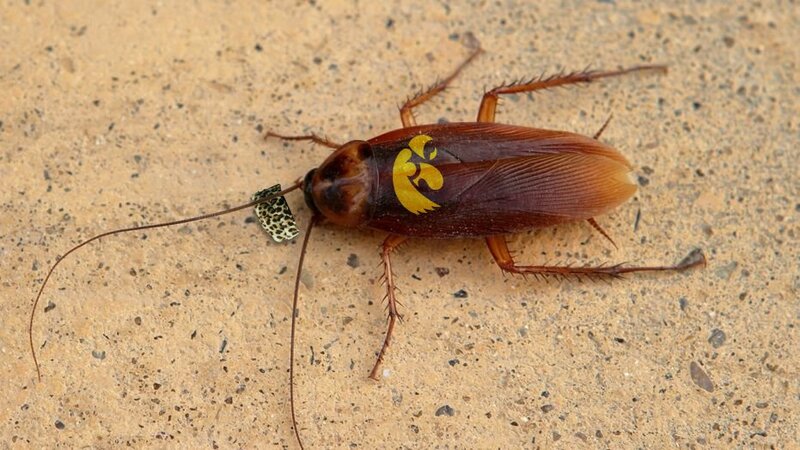 His quivering antennae tipped the Mobutu Ferentz hat from his head. It fell to the floor between his feet.